I’ve been ignoring talking about one the biggest projects/problems in our house renovation. The back wing of our house is caving in, sinking, and in utter disarray. Did I mention we’ve seen squirrels in the downstairs stealing scraps of paper. We have large holes in the side of the house where the local squirrels and cats come in to party. We know we need to call an architect but our hesitation has always circled back to money—we don’t have any. The first year after buying a house is really hard. After spending your life savings on the down payment your basically surviving from month to month till you build up a little cushion again. Me loosing my job in January 2009 didn’t help matters. I got a more full-time freelance gig this spring so I’m hoping I can start contributing more cash to the renovation. Blue Star In The House! Renovating an old house is not easy. Perhaps you don’t need an architect, a contractor will do, besides architect cost more. Recently, I replaced the old roof of my house with an asphalt roof with cooling granules. Also, I replaced my windows with storm windows to improve energy efficiency by creating another barrier between the interior and the outside. I was lucky to find a NY Roofing Company that would do this for me at a reasonable cost. The roofers NYC are dependable and highly recommended. An architect’s fees are 10-20% of construction costs, and it’s a bargain for what you’ll get. They’ll help you get the most value from the money you spend on construction, not to mention, good design decisions will add value to your property. Hi. I was reluctant to get an architect for the same reason as you but I’m so glad we did. They thought of things that had never occurred to us and the results are fantastic. In a nutshell I found the main difference was that they are trained to think in 3 dimensions while a plan is just 2 dimensions, and can’t really give the full picture. They also draw their plan after seeing the site which is more important than i realised. by coincidence $7k was the price we were initially quoted also and I balked at that, but in hindsight it was a bargain. The house is worth at least $50k more now than it would have been if I had just gone with our original ideas and it ended up costing us the same (because they identified several cost savings). If you have a plain flat clear block then an off the shelf plan is probably OK, but if you have any complications at all – and you clearly have those – I would strongly urge anyone to consult an architect. Talk to a few architects, not just one. Pricing can vary widely, but it is also important to consider design aesthetic, personality, and schedule. Ask them to provide very specific itemized proposals, that way when you compare you are comparing apples to apples. If one provides a proposal for design/construction documents/construction admin as a lump sum and another provides an hourly estimate for design only… there is no real way to compare. The money you spend will probably be less than you are anticipating, but it will absolutely be worth it. After all, your home is the biggest investment of your life, why would you want to cut corners? Good luck on finding the right architect! I can’t wait to hear more about your project! What a project you have taken on, my hat is off to you. One time I had squirrels eating into my attic and they made so much noise I couldn’t sleep. Good luck on getting them to leave. It’ll be gorgeous when it’s done. Hi Katy. You’re going to need to get a structural engineer. The architect will help but he’s not the expert for these problems. Sistering beams isn’t expensive work. Hopefully you’ve had the place checked and treated for termites–especially with swarm season starting soon. I’m not trying to add to the worries. The termites can be treated for 1,800.00 by Orkin or Terminix. They drill holes every 16 inches around the perimeter of the house and fill them with termidor poison. I’m in a 1902 Victorian wood-frame house and I know what a can of worms it can become. I’m so envious of your fireplaces and your location! maybe you are on their email list but just in case you are not…. Sounds like a scary step, but also a necessary step. I think it’s a great move and can’t wait to hear more…good luck! Katy,it’s good to get an architect in before you go any further.It costs a lot more to find out what you should have done, rather than what you need to do.Best of luck.Someday this will all be behind you and the pride you will feel by saving this piece of history will be immense. Good luck, Katy! Sounds like a smart move to call in an architect. I’m so interested to hear what the architect thinks! If you choose to use just the architect’s designs consultation, there are any number of terrific builders in M-head & Salem who also have excellent relationships with the Hysterical Society and the ZBA. Smart move on getting those structural things taken care of! I’d recommend getting a 2nd opinion if you can as well. We had an engineer tell us it was fine to install hardwood flooring upstairs before we installed a steel i-beam on a lower floor… We had doubts but did it anyway based on his recommendation. When we put the i-beam in, our upstairs flooring developed some small gaps in a few areas. Now we pretty much have to live it– which is not the total end of the world, but stil quite disheartening after so much work. Even if it’s costly, the peace of mind and solid advice you’ll be getting is worth it in the end! Doing the fun decorating part will be even sweeter knowing that you’ve got a structually sound building. Oh wow that sounds like a crazy amount of work, hope your renovations turn out just the way you want them to! your blog is great. not only do you have great taste and excellent interests (in my opinion) but you don’t only tell the stylized version of your life and home, and that’s what’s truly inspiring. it’s a well needed dose of reality in the internet design blog world! I hope it turns out to be manageable for you. I think you did the right thing in at least getting someone to assess the situation. I’ve been going through something similar with our new house. There have been some problems and initially, I put off calling people in but slowly, I just did it. And most of the time, it’s been less painful than I had anticipated. Good luck with it all! Glad you made the call Katy! Of course you need an architect—you need the stamp for the building inspector and the Historic Commission contacts. I admit that I’m absolutely biased because my husband is an architect here in Salem, but I really don’t understand why people skimp on architectural services. Make sure that your architect’s proposal is divided by his services: design, phases of design, construction management, etc… so you can hire him for exactly what you want and need. If it’s just the former, the price should be very small relative to your total renovation costs. Good luck! I understand calling a GC would be cheaper but are problems are beyond bad and I need help redesigning the back entrance. But of course I have to wait to see. I’ll know more about our next steps after our initial talk in a few weeks. Angus MacLeod, he is a designer who specializes in design for historic homes. He has a really sensitive eye for older buildings and his designs make use of space in a practical way, yet retains as many historical aspects as possible. I’m not sure what is rates are, but I would discuss that you are on a budget. Also re. those pesky squirrels, you have to get them out. I would recommend getting rat wire from the hardware store and placing it over the holes, they can’t chew through it. I had one living in my soffit. That was fun trying to get him out, as it was up 30 ft.
Also I’ve heard ammonia soaked rags keep evil critters out. Hi – if I might make a suggestion for those of you struggling with money? You really don’t need an architect – look for a builder who does his own design work and has a lot of experience with period homes. You pay far far less for consultations and design work. Plus they do the work themselves which saves more money and time too. These guys are hard to find – they usually only have one or two jobs going at any given momemnt, they don’t advertise much, so you might have to rely on word of mouth. My father is like this (sorry, he’s in NH)No formal training but years of working on older houses. He designed my house and everyone thinks it’s an antique. Good for you. Finding the ‘right’ architect isn’t always easy, but once you do the money will be well worth it (especially in the long run). Best of luck to you on this grand adventure. And, btw, I really enjoy your blog. 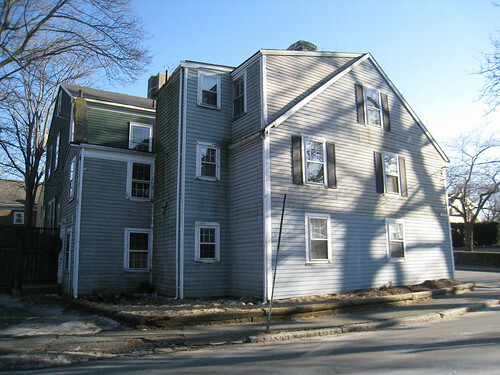 I can’t wait to hear how your meeting with your architect goes, and I just want to say how FUN it is to read your blog (as a Bostonian who can’t afford to buy) and how great it is to see you tackle the restoration of such a gorgeous, historic house! We live in Marblehead as well. Two of our friends are very good architects and have each started their own businesses. They might be able to give you a competitive quote. If you think you’ll be in this house for awhile- go for it. We have done extensive remodeling in 3 stages to our 1937 cottage and money spent on an architect was the best investment we ever made. Get the “bones” right and u can always tweak and upgrade the other stuff as it becomes affordable. We have been in this home for 20 plus years! Time to remodel again! these old buildings are tough cookies. 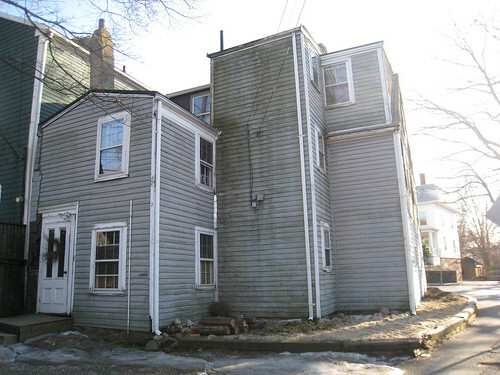 we’re actually selling our condo in a c.1900 brick building in cambridge. the plumbing is a time-bomb, and we just had to pay a $4k special assessment for a tear down and rebuild of the back decks. the maintenance never ends, and i can’t even imagine dealing with an entire house. good luck with your architect. i wish my architect husband knew a thing or two about these things, but he’s just starting out. Ugh, it’s always the old add-ons that cause the most problems. My husband and I are dealing with the same issue with the add-on next to the kitchen which looks to be sinking. Our little attached greenhouse is also contributing to water damage in the same area. We called an architect and he estimated his cost would run around 7k. That’s just too much for us to afford (we just bought the house in November so our nest egg was pretty much wiped out on the down payment too!). Now we play the waiting game until we have enough money to purchase a plan. That could be a while though. It’s very frustrating playing the renovation game. I just keep looking at the big picture, but it’s tough sometimes. I’m just glad spring is here. Spring sun at least makes everything seem better!